Abinger Forge, Blacksmith. | Traditional Blacksmith's Forge in heart of Surrey Hills, England. Traditional Blacksmith's Forge in heart of Surrey Hills, England. As from December 1st 2016 we’re not working out of Abinger Forge, Abinger Hammer. However we are still open for general Blackmithing and Decorative Ironwork at Burrows Lea Forge near Shere, Surrey (less than 2 miles from Abinger Hammer). Abinger Forge is a traditional Blacksmith’s Forge in the village of Abinger Hammer hidden away in the Surrey Hills. We’re a Blacksmith’s shop specializing in hot forged work; covering all aspects of the Blacksmith’s trade from General Repairs to Public Art to Fire Tools to Entrance Gates to Heritage Restorations…… and everything in between. Abinger Hammer village as the name suggests, used to be home to a large water driven trip hammer, that was used to forge Wrought Iron smelted by local small blast furnaces. We are very proud to continue this heritage and put the Hammer back into Abinger Hammer. Hand forged fire basket in a contemporary style. 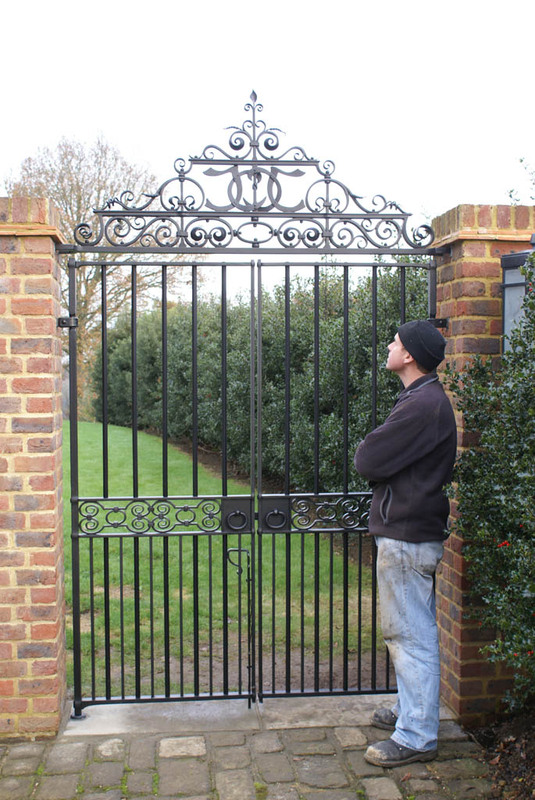 Abinger Forge specializes in bespoke hot forged Ironwork. Your work is designed in-house, working from concept through to installation. Abinger Forge is a one stop/turn key shop, where the client or agent can be reassured of a truly professional service albeit in Artisan surroundings. Abinger Forge’s Artisans are fully trained, holding industry specific awards with unrivaled Forgework knowledge and skill. We keep our designs and working practices fresh by being deliberately open minded and good humored. We believe that fundamentally there is little difference between traditional and contemporary styles and practice for a craftsman, in fact a lot can be learned and implemented from both disciplines. I’m looking for a small dragon, maybe 1′ tall, to be used as a house number. ideally, i would love to have the numbers 103 set in fire coming out of his mouth. is this possible? what kind of cost? thanks so much. not sure about the size. could be bigger or smaller. Thanks for the enquiry… I’ll Email u direct. Hi, this is rather a pedestrian enquiry, but I’m hoping you might be able to copy a large church key. It has about a six inch long shaft—if you’re interested, I’ll send proper dimensions. Is this the sort of thing you might be able to help us with? Hi, I am looking to commission a three tier cake stand, with a pouring jug at the top and the base to spell out initials, for my friends wedding. I have a idea of size’s and details if this is something you could quote for? 'Tijou' gates at Petworth House. Conservation & Restoration of the ‘Tijou’ gates at Petworth House, West Sussex by Burrows Lea Forge Ltd.
Edenbridge & Oxted Blacksmith Competitions South East England’s most popular Blacksmith Competition, held every August Bank Holiday at The Ardenrun Showground, Tandridge Lane, Edenbridge. Don’t be shy…. please show your support, ‘Like’ Burrows Lea Forge on Facebook – only takes a second or two & helps promote my business enormously – Thank you.